And this isn't even the tip of the iceberg. 1. Because of white privilege, you'll never have to worry about becoming the victim of law enforcement officers. Think about Jonathan Ferrell, Amadou Diallo, even Oscar Grant. It isn't a coincidence that hundreds of incidents like these have been happening for years. 2. Thankfully, you'll never have to know what it feels like to see your teenage son's death being mocked. Yes, that is someone dressed as Trayvon Martin. Yes, you're looking at someone in blackface. In 2013. 3. Because of white privilege, you'll never have to inform your children of the harsh realities of systemic racism. 4. White privilege means you can be articulate and well spoken without people being "surprised." 5. Because of white privilege, you'll never know what it's like to have the following statistic looming over your head. According to this report , one-third of black men will go to prison at least once in their lifetime. 6. You can wear and act however you'd like without being labeled a thug, low life, gangster, etc. Everyone wants to "act black," but no one truly wants to be black. 7. White privilege allows you to speak on any particular subject without being the sole representative for your entire race. 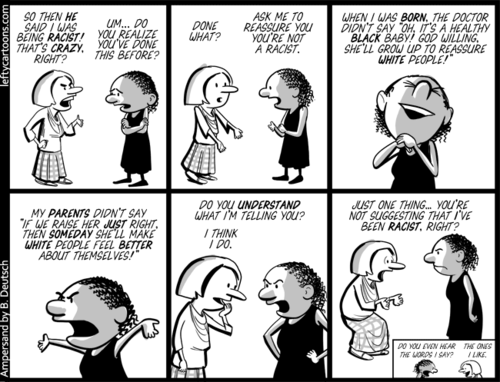 White privilege allows you to believe that all people of color think alike and share similar views. 8. White privilege means no one questions why you got that really great job; it's assumed you were just highly qualified. Also, it means that you got into that prestigious university based on merit, not because a certain quota had to be filled. 9. White privilege means not having to worry about your hair, skin color, or cultural accessories as the reason you didn't get a job. People of color must assimilate every.single.day. It's hard to break free of the ways of the dominant hegemony and forge your own path. 10. White privilege means you don't have to worry about being monitored in a store just because the hue of your skin is a bit darker than most. People of color are seen as leery and untrustworthy. 11. Having white privilege means people will never label you a terrorist. 12. White privilege means not being affected by negative stereotypes that have been perpetuated and ingrained so much into American society that people believe them to be fact. Black men are angry, primitive beasts with insatiable sexual appetites. 13. White privilege means you never have to explain why cultural appropriation is a bad thing. 14. White privilege means not having to worry about being stopped and frisked. 15. If you benefit from white privilege, you'll never be told to "get over slavery." 16. White privilege means that you're never just your own person. For example, Nicki Minaj is often referred to as the "black Lady Gaga." I guess black people can't be quirky or eccentric. 17. Benefitting from white privilege means you can walk the Earth unaware of your color. People of color don't have such a luxury.